If you wanna create romantic atmosphere inside your home when you are alone with your hubby then these are the perfect treats to enjoy. I made them for my hubby's birthday and he loved them. In fact you can even make the environment more romantic by putting on some dim lights or by lighting up some scented candles. These treats are simple to make and delicious in taste, I made them before but they didn't come out very well as my choice of chocolate knocked it down. I would recommend you to use Hershey's dark/milk chocolate. These treats can also be made a day before the party and can be served as an appetizer, kids will love them and this is also one of the best method to make kids eat fruit. Wash the strawberries and pat dry with paper towel or a clean cloth. Hold the calyx part (The green leafy part) together with your fingers carefully and insert tooth pick at the center. Dip the strawberry while holding the calyx or tooth pick and make sure it is coated well on all sides. Knock off excess chocolate on to the side of the bowl while taking out and insert the free end of the toothpick on to the foam or thermocol sheet. Repeat the process for all the remaining strawberries. If you want to decorate with any confetti this is the right time. After adding confetti you can store them in the fridge to make the chocolate hard. Later you can decorate with white chocolate and refrigerate them again. These are good for 7days if you refrigerate properly. Warning: Never store them in a freezer. 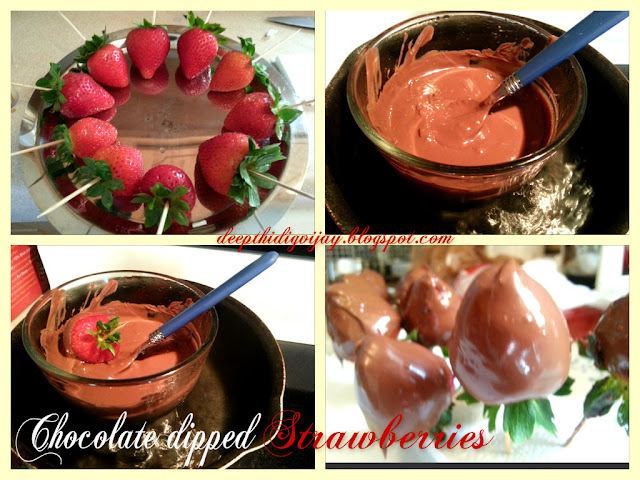 Excellent and delicious looking combination of strawberry coated with chocolate. I had it before in a party, yours looks fantastic....delicious. Perfect dessert for parties.Healthy too.Happy to be your follower. 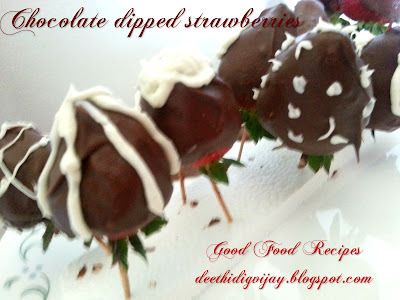 This chocolate dipped strawberry is really a romantic dessert recipe which would be easy to make on a fabulous occasion.